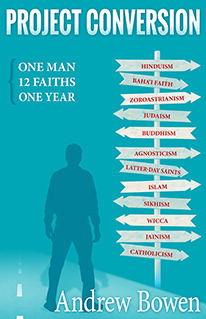 How could you practice twelve different religions? What effect would it have? Andrew Bowen did exactly that. Then he chronicled the experience, and the crisis it provoked, in his new book Project Conversion. Your Rogue Priest was asked to write the introduction. With his permission, I’m sharing that introduction here. The book was a powerful read for me and I hope all of you get a chance to read it yourselves. Andrew Bowen is the only extremist I’ll ever love. He is the perfect recipe for an extremist. From his childhood ultra-Christian identity to his military training, in another world Andrew’s message would be violence. Here he chose peace. But extremists tend to remain extreme even when their allegiance shifts. A pendulum that swings too far will swing very far back; it does not stop in the middle. Thus, when a hardened criminal finds Jesus in prison, it’s rarely a middle-of-the-road, do-your-best kind of Christianity. The book will be thumped. Voices will rise. It is a case of all or nothing. All, or Hell. The most repressed childhood spawns the wildest punk. We’re fortunate that Andrew chose reconciliation over hatred, but make no mistake: his peacemaking is radical. If you were called to learn about other faiths, how would you do it? A class, a book, go with a friend to church – these weren’t enough. Andrew chose to immerse himself completely and piously in twelve different faiths, with a zeal that some lifelong members don’t match. Humanity demands diversity. It’s our greatest strength. A homogeneous population is unable to adapt, innovate, change. So the most important project of humanity is also our most challenging: not just to accept but to admire people unlike ourselves. When the brave admire the risk-averse, when the scientist admires the artist, that is when we have complete genius. A tribe needs all its parts. Even its extremists. Because those who insist on going the farthest will sometimes discover what no one else has seen. Andrew Bowen has, I believe, made such a discovery. It took just one conversation with him to convince me of this. I didn’t want to believe it. As a priest myself, when I first heard of Project Conversion I had only criticism. It’s shallow, it’s disrespectful, he may be going broad across many traditions, but he won’t get deep into any of them. The truth is I’ve seen students practice a religion for years and never go as deep as Andrew does in one month. Their love of their faith came inch by inch, but Andrew’s love for his twelve faiths was total, because he needed them to save his life. And in that total devotion, that total submission to wave after wave of faith and crisis, Andrew became enlightened. It’s not an experiment everyone should perform. He hasn’t been careful, he’s been reckless and zealous and put his own wellbeing at risk. But his sacrifice has changed what we know about the world. Andrew asks: Is a complete view of the divine a triangulation from separate points of view? Many people take a little Buddhist meditation, a little Gospel, a little African drumming. It services their existing belief that all religions teach the same great truths. That’s a religion of its own. But Project Conversion enters each religion at the exclusion of others, looks fully through their eyes, and charts the divine like constellations until a complete star map is made. Andrew Bowen offers us a new perspective on faith. One that is, perhaps, more complete than any single religion, more thorough than eclecticism. It has placed him beyond faith and doubt. Most readers, I suspect, will not identify with Andrew’s extremism. Most of us have not brought friends to tears condemning them to Hell, or lived homeless with an ecstasy habit. Most of us can say with pride that we don’t have the same level of prejudice that our author once had. And that is our most dangerous moment. It was the strength of his convictions, maybe even his flaws, that brought Andrew so far in the other direction. He crashed through his bias and saw the other side. We too have bias. We too judge others, both those who are different and those who are all too similar. We may not go as far, but we do have prejudice. And if we think Andrew swung too far in the other direction, that might be an easy excuse not to swing that way at all. And that we can open both eyes, if we live like they do. You can snag Project Conversion in paperback or for Kindle. I hope you enjoy it. The campaign for Magic to the People is still going strong. Come join us! → What Happens on Mardi Gras? ← What if Everyone Had a Magician? You make me want to read this. O dear, so many books, so little time. Says the guy who advocates getting rid of your books :P (jk) Great intro, certainly compelling. I love books – I prefer to collect them digitally, is all. Thankfully this one is available digitally and if it were me I would opt to buy it in that format – but Andrew has made a paper version available as well.